Disneynature’s Chimpanzee calls to mind March of the Penguins, minus the ice and snow and high-minded narrative. Both films unfold in treacherous landscapes traversed by intrepid filmmakers who test the limits of Mother Nature, time-lapse photography and technologically advanced film equipment. Their goal? To capture–on film–big moments in the life cycles of captivating creatures. Both films similarly feature voice-overs by notable actors. And Chimpanzee, like March of the Penguins, is destined to become an evergreen nature and wildlife classic. Chimpanzee is narrated by Tim Allen, whose “voice” is beloved by young fans of the Toy Story franchise. I was convinced that his narration (which frankly sounded sappy in the film’s TV ads) would fall flat and send me running from the theatre. Not so. The narration, in fact, is gently educational and engaging and manages to soften (for young children and squeamish adults) some of the high drama that unfolds (mainly off-camera). The soundtrack’s original songs are lighthearted distractions and thankfully few and far between. Allen’s narrative reflects upon the daily habits of the chimps (in the “great rainforest in deepest Africa”). If you stay put during the closing epilogue and credits, you’ll find out the exact location (the Tai Forest of the Ivory Coast), and you’ll meet the filmmakers whose challenges in that location are recapped in fascinating, but all-too-brief clips. Chimpanzee focuses on newborn “Oscar,” his tenderly attentive mom “Isha,” their extended family, and most especially alpha male “Freddy,” who had an amazing surprise in store for the filmmakers. As the days and months go by, we watch as Oscar learns the ropes in his forest habitat. He plays and climbs and begins to eat solid food that requires developing the masticating and manual skills, respectively, to properly digest and forage for fruit, nuts and ants. And he experiences the rules of “the hunt” firsthand by watching adult chimps entrap small monkeys for meat. 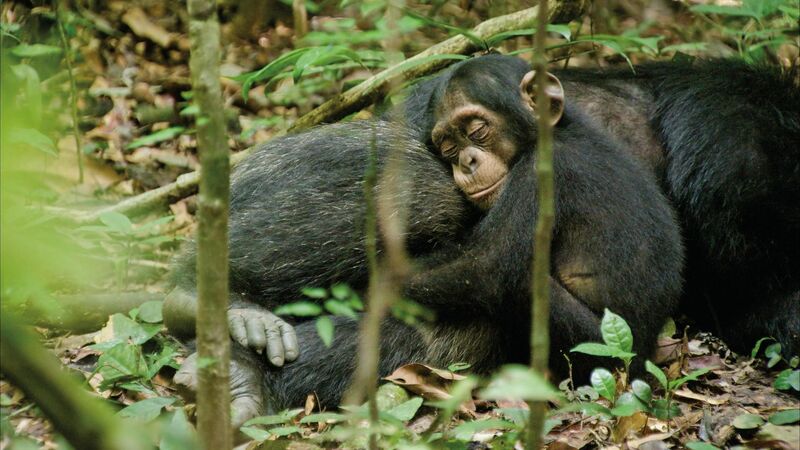 Despite these tentative teaching moments, Oscar never ventures far from his mom, reminding us how closely aligned chimps are to their human cousins. Drama builds when a rival band of chimpanzees encroach upon Freddy, Oscar and Isha’s favorite fruit and nut groves. Led by wizened “Scar”and his team of macho marauders, these chimps orchestrate stealthy maneuvers that are fascinating and unnerving to watch, as is the resulting upheaval in Oscar’s life. As with many of the best nature film projects, Chimpanzee took an unexpected turn that shocked the filmmakers and turned a simple lifestyle chronicle into an instant classic. Suffice it to say that the role reversal exhibited by previously aloof alpha male Freddy will touch the hardest of hearts. In fact, Freddy’s behavior and the exquisite filmmaking, as a whole, so impressed Jane Goodall that she put her imprimatur on the film and has taken to the airwaves to promote it. The Jane Goodall Institute will see a cut of the proceeds from the first week’s box office. Chimpanzee speaks directly to kids, but the message is clear for all ages who need to hear it. These are exceptionally intelligent creatures who share 99% of our DNA. It is noted in the epilogue that in 1960 one million chimpanzees lived in the wild, while only 1/5 of that number now remain. Their loss is a tragedy that impacts us all. There are other lessons to be learned here as well, most notably the reasons Scar and his team eventually fail in their efforts to drive Freddy and his family off their turf and into oblivion. Scar’s leadership and alliances are compromised. While Freddy turns out to be an old softie whose sensitive side never compromises his leadership within his extended family. There are many good reasons to take the kids, young and old, to see and learn from this film… during its first week, to support Jane Goodall’s tireless work on behalf of chimpanzees and, thereafter, to understand and promote the protection and humane treatment of these amazing animals. This entry was posted in Film and tagged Bereavement, Chimpanzees, Disneynature, Family Relationships, Jane Goodall, Nature & Wildlife, Surrogate Parenting. Bookmark the permalink. Thanks for the review. I hadn’t thought of seeing this film, but now I’ll give it a shot. I’m happy that you’ll give it a shot. It would be an especially rich experience for you to watch it with your grandsons, especially the eldest. They might really enjoy it and learn alot from it. Let me know what you think and how they react to it if they see it.